It could not have been more simple. A straw covered lot in heart of the city, a few dozen people, a pick-up truck with its bed brimming with potted plants and baby trees, a pile of shovels waiting at the corner of the lot. Yet the simple gathering had an air of magic to it that I can still feel, two week laters. 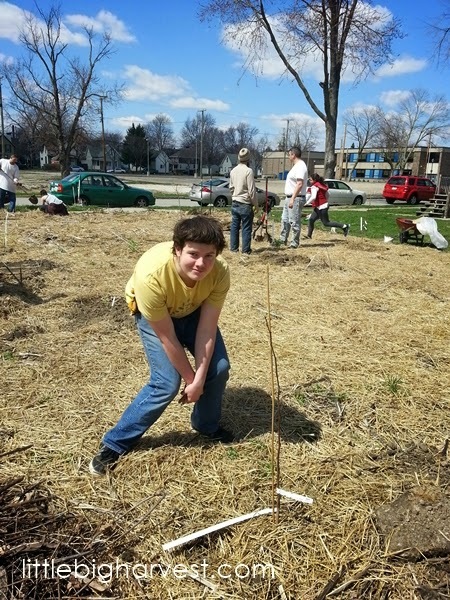 Patrick (my oldest, 16) and I headed out two Saturdays ago, and lent our hands to help build a "food forest". It was an amazing experience that we won't soon forget. 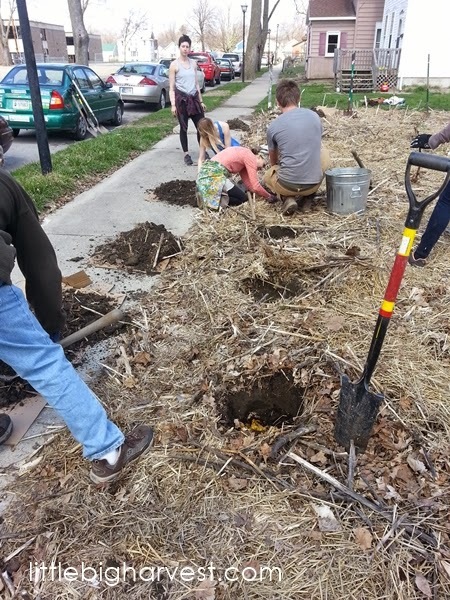 Everything had already been gathered: the plants, the soil amendments, the tools, and all we had to do was show up (though admittedly, we did bring our own work gloves and trusty shovels, well-worn from working in our own backyard). The planting of the food forest as a community effort was the culmination of many months of careful planning, however. The event was organized by a dynamic young couple who call themselves The Young Urban Homesteaders. They define a food forest simply as "a perennial edible garden that mimics a mid-succession forest ecosystem." Think permaculture. Think low-maintenance, long-term food growing that will also look beautiful. Think tiny forest in the middle of the city, bursting with fruit and berries, year after year. 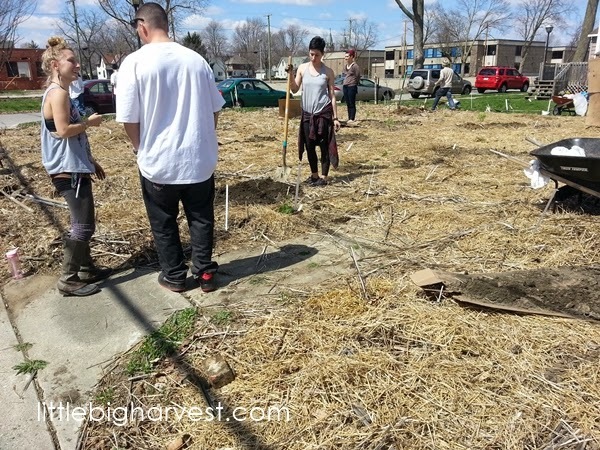 Samantha and Philippe, the two-member powerhouse team of the Young Urban Homesteaders (or YUH as they dub themselves) had put an open invitation out to the community on Facebook to help 'build' this food forest. It came with a warning; "We don't want to romanticize it. You will be digging holes...lots of holes. But then we are putting beautiful edible trees and bushes in those holes and laying the foundation for a gorgeous forest garden." 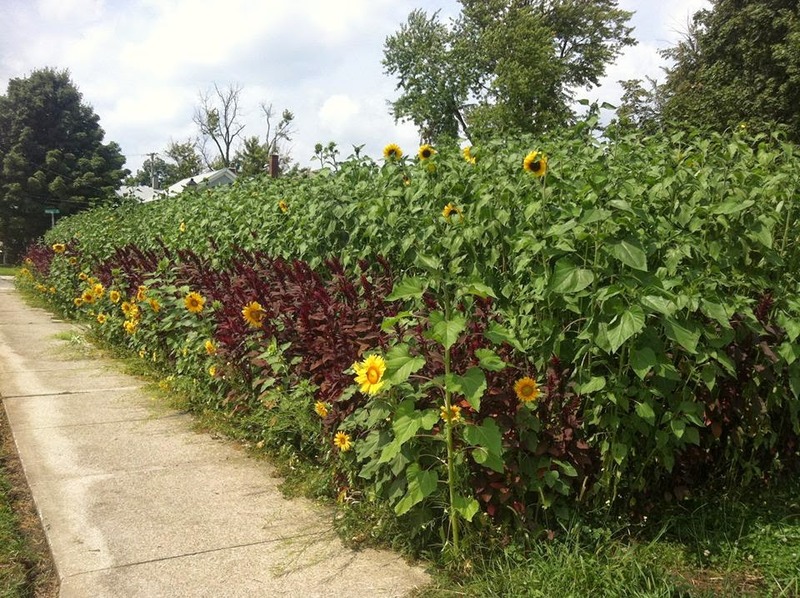 I've been obsessed with the idea of urban gardens--especially on empty lots--for years. In my mind, I've always seen rows of raised beds, compost bins, rain barrels; tiny oases of cultivation providing incredible amounts of healthy food. These are really wonderful images of tiny food-production units, but my ideas have expanded a little. Though I still love seeing tiny urban farms and gardens popping up around my city, I'm also beginning to see the power of permaculture. Click here for an article that includes practical Polyculture growing ideas. 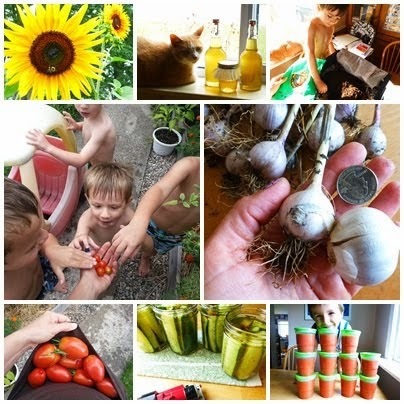 Click here for a comprehensive introduction to permaculture, written by one of my favorite urban farming websites, Tenth Acre Farm. If you get a chance, look up this documentary, Inhabit--it's a beautiful film showing many permaculture examples in urban, suburban, and rural settings. You'll get some really good ideas and perhaps some inspiration from those links. I'm starting to understand permaculture as a way to not just sustain the ground that you grow food on, but to also heal it, make it better than it was before. 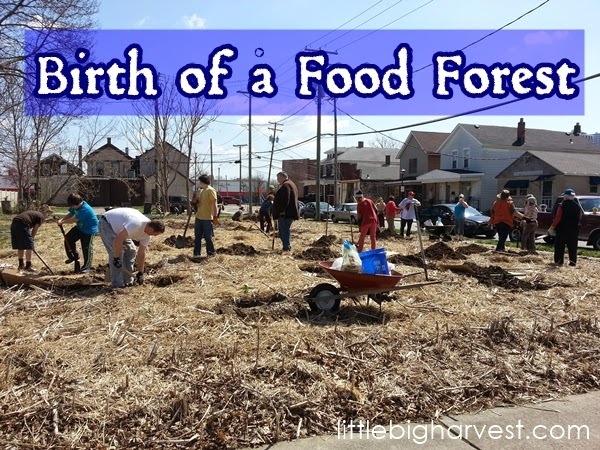 Food forests have the capability of continually providing food while healing the ground, nurturing native species that have been all but lost from the cities, and becoming self-sustaining. Even the most avid and passionate gardener can find themselves suddenly abandoning a lot full of raised growing beds despite their best intentions. I've seen it happen. On the other hand, a food forest has the potential to grow and thrive for decades--or longer--whether the original planner(s) stick around or not. I think there is a place for cultivated annual veggies and food forests throughout the city. Seeing the birth of a food forest on that gorgeous Saturday only heightened my interest and made me realize how much potential this idea has. The Young Urban Homesteaders are true visionaries, and I really appreciate that they invite the community consistently, with open arms. They are sweet, soft-spoken, and have a peaceful, welcoming aura about them. They grow tons of produce on a double lot in the city, not too far from the newly planted food forest. 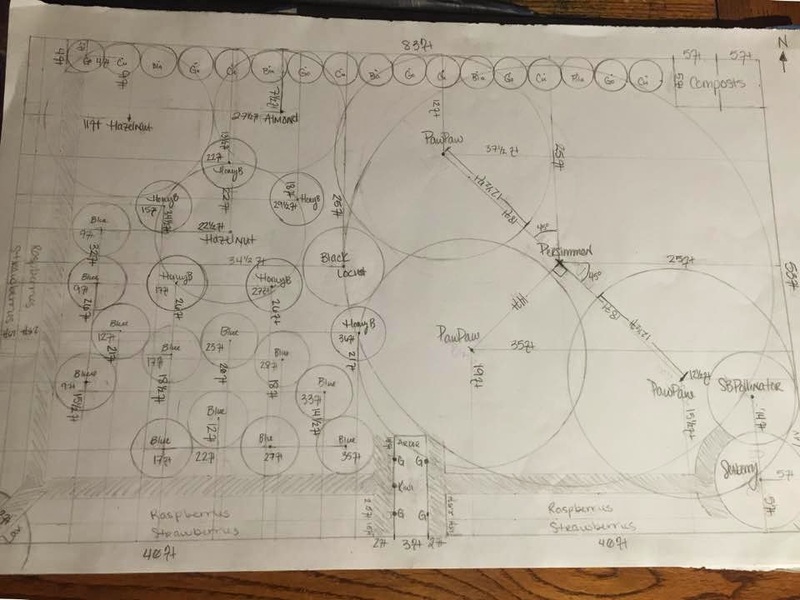 The food forest is one of their current projects (the double lot they live on and farm is an incredible undertaking in itself), and I have a feeling they will continue to grow new projects and spread inspiration as time goes on. 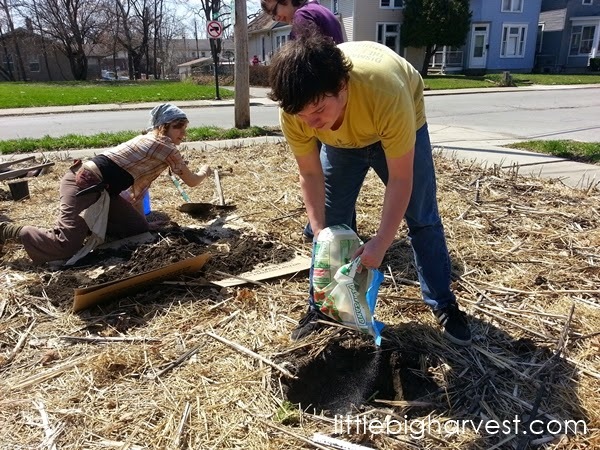 Having urban farm visionaries like the Young Urban Homesteaders is so important. Because they are willing to have the community help and learn, it allows people like me to come out of their comfort zones. I'm a hermit by nature. I'd hole up in my house and my yard for all eternity if I could. Yet as I've learned more about growing food, especially in an urban setting, I'm starting to discover that it's very much a community affair. Getting out and meeting new people is not such a bad thing! I can expand my knowledge in ways I'd never be able to on my own, and I can see projects that I have so far only read about actually coming to life right before my eyes. What a valuable asset, these young teachers! Philippe admitted that he did feel a little trepidation about the project. It's a pretty big undertaking even if by the time we all showed up to help it seemed so simple. Sometime during the planning, a neighbor approached him, a man who has lived in the neighborhood for many years. He told Philippe that thirty years ago, he'd had a dream about young people growing food in the empty places of the neighborhood....long before this particular lot was was even empty. This story gave me a deeper sense of connection, and made me realize that the projects like these tie us all together in ways we may not even realize. Whatever fears or trepidation Samantha and Philippe may have doesn't stop them from starting their inspired projects (I could really learn from that...if I would just do all the plans I make!). Last year YUH raised funds with some creative community outreach and bought this lot. It was actually their fundraising efforts that first caught my eye and piqued my interest in their vision. In its infancy, the lot certainly didn't look like much. It was a typical grassy, weedy, trash-strewn 50' by 83' piece of earth. I had probably driven past it dozens of times and never even noticed it. Soon after they had raised enough funds to purchase the lot last spring, they invited the community to come help clean up the lot, "Treasure Hunt" style. If treasure was found, the finder could keep it. This appealed greatly to my middle son, Simon, and so during a hot afternoon last April, we scoured the lot with our work gloves. We picked up every piece of trash we could find, and quite a few 'treasures' as well, at least in Simon's 10-year-old eyes. Simon brought home a polished piece of discarded glass, a carpenter's pencil, a keychain, a feather, and other items that had been long forgotten in the soil. Samantha and Philippe tilled the lot and planted pounds and pounds of seeds--mustard greens, amaranth, sunflowers--in order to draw out any toxins that may be present in the soil. See their video here about how these plants can detoxify city soils. YUH did all the planning, all the work, made all the hard decisions. They spent hours gathering soil amendments and preparing for planting day. And then they graciously offered to share this beautiful plan with whomever wanted to show up. As they said in the open invitation: "We want to share what we know and learn what you know. We are all learning together." As I dug into the soil that morning, and saw hundreds of happy earthworms squirming around inside the fresh holes, my mind was swirling. It was the first truly beautiful spring day of the year; brilliant blue sky, warm sun, the gentlest breeze. I was gathered with over thirty perfect strangers, making pleasant small talk and enjoying the gorgeous day, and I realized I wouldn't have wanted to be anywhere else. It felt good to work together on this dream. What would have taken an entire weekend if only a couple people were planting took less than two hours. We dug the holes, placed into them veggie/fruit scraps, coffee grounds, a little sand for drainage, and then tucked the plants in. There were over 40 varieties (see the list at the end of this post), which I find just astonishing considering the meager size of this lot. The baby plants were tiny, the trees not much more than twigs. When I stepped back and looked at the lot as a whole, it was hard to even make out the plants we had put in. However, if I stretched my mind a little bit into the future, I captured clear glimpses of what this lot will turn into; I could see the grape arbor, the living walls of berries, the tall hazelnut and almond and pawpaw trees. This lot is really going to be something amazing, and I'm going to love watching it change and grow through the years. I'm already looking forward to writing updates. If you don't have an entire empty lot to work with, you can implement so many ideas within your own yard. Edible landscaping and pockets of permaculture can fit in some really tiny places! What if you plant something and it dies? What if your ideas don't work? It's okay. Everyone starts somewhere. You can add stuff later, change things around. The best thing you can do right now is to barrel through your fears and plant something! 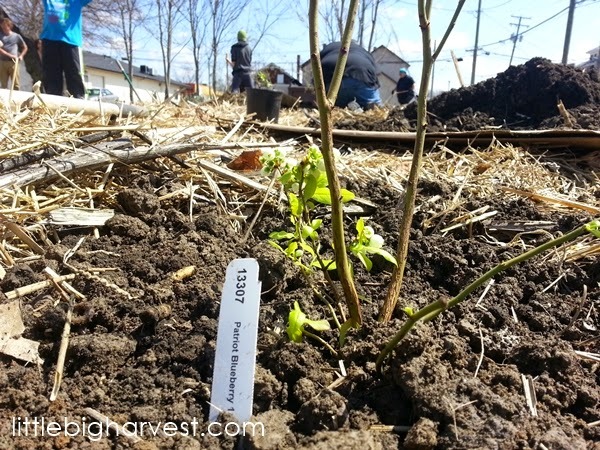 If you are interested in planting a food forest filled with delicious perennials, there are many resources you can look into. Your imagination really will be the limit. The idea is to discover native plants of different varieties and sizes, to create a little ecosystem. Google 'permaculture', pick up a book or two from the library, and do some reading. Then, most importantly, start planting. Don't stop growing your annual garden--but look around for places to put some permanent native edible plants as well--they may just outlive you while providing food every year! The Young Urban Homesteaders bought all the plants for this particular forest from Starks Bros Nursery. I love 'window-shopping' there. When you find a plant you are interested in, you can search to see if it is a good fit for your growing zone. Newly planted in this food forest were: blueberries (9 varieties), grapes (4 varieties), gooseberries (3 varieties), currants (3 varieties), pawpaws (3 varieties), hazelnut (2 varieties), honeyberries, raspberries, blackberries, hardy kiwi, almonds, seaberries, and strawberries. YES, that was all on one 50' x 83' lot! I hope you will post updates. What a magnificent project and an incredible amount of fruit planted in a small area! I can't wait to post updates! This little lot is going to fill out and become an amazing little ecosystem. Thanks for reading, Diane!